BUY this great looking deck —-> HERE. Another common question is about relationships. 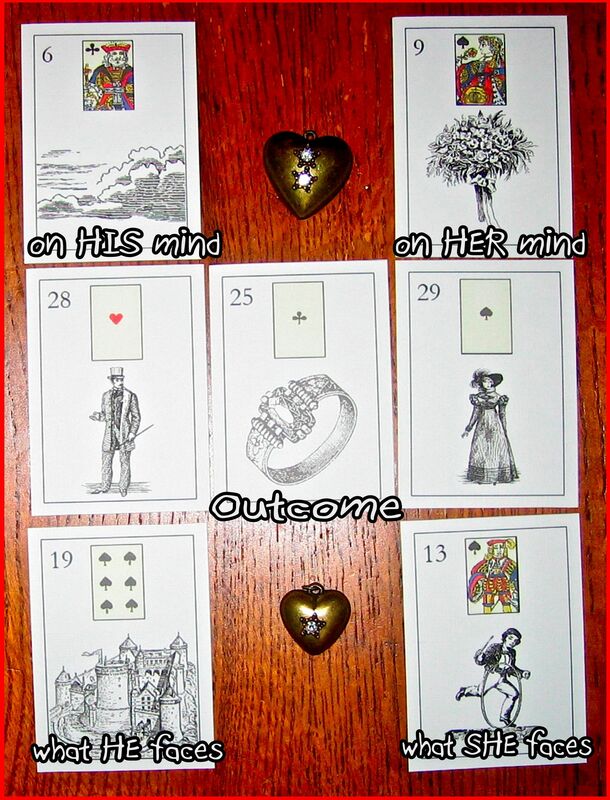 I am using the LeNormand ARLO deck to illustrate this interpretation of the Lenormand cards in the Heart Layout. 1. Remove the Lady and Gentleman cards from the deck prior to shuffling. Place them on the table so that there is room for one card between them. 2. Shuffle the cards thoroughly thinking about your relationship and the person who you are involved with perhaps what’s they are thinking, etc. Maybe you don’t even know yourself what you really are feeling. The cards may reveal additional information you hadn’t expected. 3. Cut the deck as many times as you feel necessary and proceed laying the cards according to the image. 4. Place card 1 above the Gentleman, card 2 above the Lady, card 3 beneath the Gentleman, card 4 beneath the Lady and card 5 between the Lady and Gentleman. LADY Kelly is asking the question about the relationship and it certainly looks like there is a connection between them (RING) I would have to say that this GENTLEMAN was really confused at the time these cards were selected. She (Lady Kelly) on the other hand thinks there is nothing wrong. You have to remember that the Bouquet / Flowers does represent a dark-haired female as well. The Queen of Spades can be another woman and so can the Snake card. The GENTLEMAN in question is facing a separation or parting of the ways. It appears that there will be a broken commitment (Ring). When reading the cards in this layout refer to the outcome card for additional blending. Our LADY will be facing some fresh new starts. I get the feeling that this connection with the GENTLEMAN is not completely over as the outcome card (Ring) provides some continuation in conversations. As the Jack of Spades interpretation I would caution the LADY to remain open but not naive in her encounter with this GENTLEMAN. Most of the time the Ring card lends positive energy with the promise of continued efforts insofar as relationships are concerned. Even though the Ring card is loosely flanked by the Clouds/Tower cards depicting a disruptive energy it is also flanked by the Bouquet/Child cards suggesting another turn of direction in this entire situation. Will the Lady and Gentleman continue corresponding? The Ring card in the outcome says most likely yes. The Ace inset on the Ring card represents a “new” energy which is strongly linked to the Child card’s meaning (what she faces). Just found this site visit a post by Gina Pace in the Lenormand Cards Study Group on FB. Think your material and approach are terrific! I am writing to request to be added as a user to your Ask My Lenormand Cards blog. I tried to find a way to email you but cannot locate your email here. My apologies if this is an inappropriate post. Thank-you for this. yes this is right in your reading of the cards. 24 hours after the spread- more information came to hand. yes he is wanting to walk away.and yes there was confirmation of another woman- (queen of spades) which had been concealed. there will be continued communication as he has offered to write an apology for past. (its a long story of our time 2gether) and of course i have emailed and written him also.. but does the cont. contact you speak of with the ring go beyond this? then a five card what the future looks like form here? they will not be together in the future. The man will be single (tower) and will regret the lady (clouds). She will have a new relationship (child) and she will engage (flower + ring). The man, in the future, will be “ex – boyfriend” = clouds above him. That’s what I see in this layout. and are there any major changes so far ? Yes, I always read cards above consultant as his/her character or situation in present or immediat future. In my experience, man + clouds = exboyfriend, exlover. But I have not experience as you are! Hi Tania: I read the card above/after significator card to describe the character as well. You must have experience with gentleman & clouds to mean ex-boyfriend, etc. I may be experienced but I am always open to other people’s insights because I am continuously exploring.